It’s that time of year again: The Rose & Bay Crowdfunding Award is open for nominations, and part of the process is making certain nominees have a landing page for people to go read about their crowdfunding efforts in 2011. 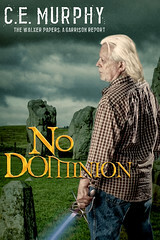 I’ll be doing two landing pages for 2011: the “No Dominion” Kickstarter campaign, and the Old Races Short Story Project. Magic Hath An Element, the first chapters of URBAN SHAMAN, as seen through Gary’s eyes instead of Joanne’s, and Forgotten But By A Few, the first “No Dominion” campaign short story.